Directorate General of Civil Aviation is going to recruit fresher candidates in India for Senior Flight Operations Inspector & Flight Operations Inspector Posts. So, those candidates who are willing to work with this organization they May apply for this post. Last Date of Apply 30-June-2017. Total numbers of vacancies are 13 Posts. Only those candidates are eligible who have passed Airline Transport Pilot’s License issued by DGCA India with current Pilot-in-Command rating on civil air transport aircraft. 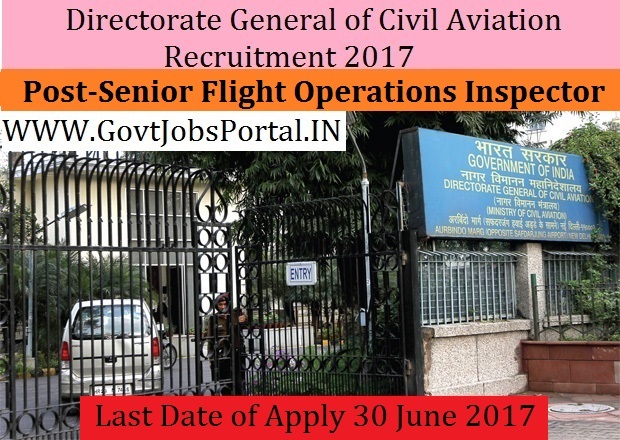 Indian citizen having age in between 24 to 60 years can apply for this Directorate General of Civil Aviation Recruitment 2017. Educational Criteria: Only those candidates are eligible who have passed Airline Transport Pilot’s License issued by DGCA India with current Pilot-in-Command rating on civil air transport aircraft. Age Criteria: Candidates age limit should to be possess minimum age 24 years & maximum age 60 years.